From Uwe Boll to Michael Bay, Avalanche has ramped up the explosions for Rico’s latest adventure, says Alex Donaldson. While the first two Just Cause titles were met with a solid critical reception and decent success, it’s fair to say that Avalanche Studios’ tropical anarchy simulator gained something of a cult following in the wake of its second entry, a reputation further fuelled by a loving PC mod community, the star of which is a massive multiplayer mod. Just Cause 3 aims to take that growing fan base and run with it, all while simplifying design in key areas to help make the franchise’s particular sun-soaked brand of insanity more accessible – and after an hour with the game, half of which was spent hands-on, it seems to be right on target. Certain key design decisions Avalanche has made make it plain: they get it. 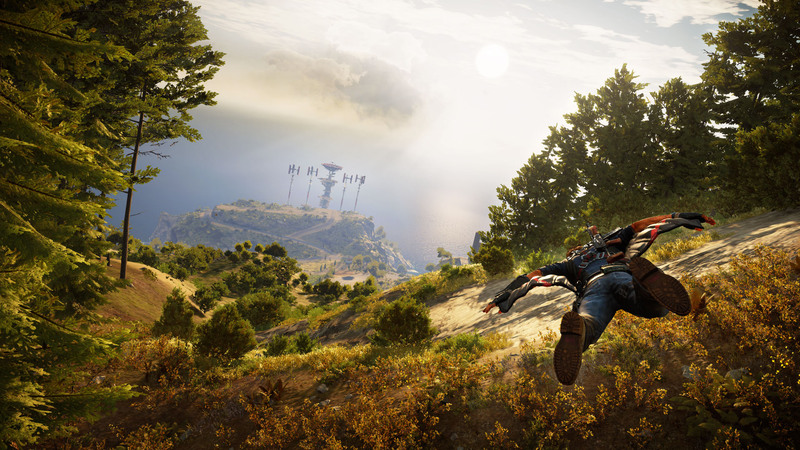 The hands-on demo we get isn’t ideal, with our session limited to challenge-style trials rather than the full freedom of the open world – but even that offers insight into where Just Cause 3 is targeting. The challenges I play will be present in the final game as a way to earn upgrades, essentially divorcing power ups for Rico’s explosive arsenal from story progression, instead attaching it to side challenges scattered throughout the world. Art director Zach Schläppi emphasizes this as he narrates the hands-off portion of the demo. Freedom is key, he explains, and not everybody may want to sit through Just Cause 3’s narrative. If that’s the case, they can simply tool around the island and will in the process find plenty to do, being able to upgrade Rico’s abilities along the way. 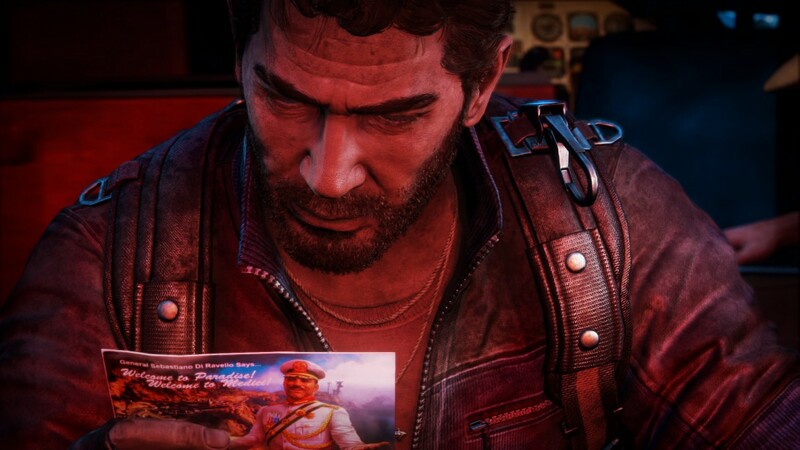 “Just Cause 2 was like an Uwe Boll movie by comparison,” he grins. 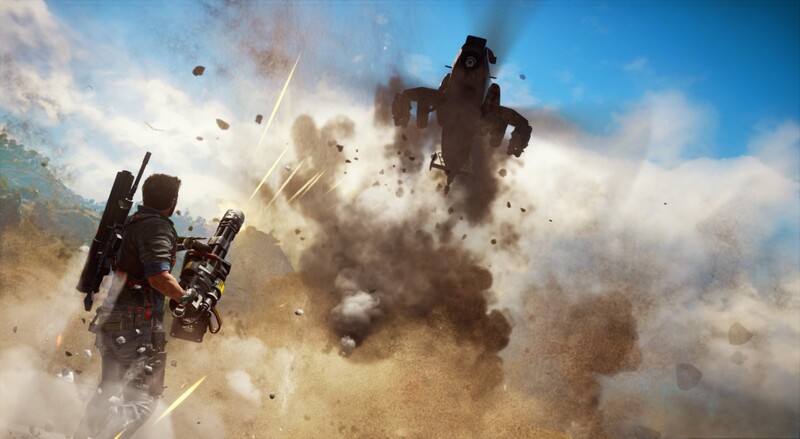 Just Cause 3, he says, will retain a degree of the cheese and Michael Bay-style over-the-top explosiveness. But it maintains a higher production value along the way. That’s obvious in the hands-off demo I see, which manages to strike a solid balance between bombastic and ridiculous. What’s ultimately shown to us is the full version of the same mission that makes up the most recent trailer for the game, shown at Microsoft’s Gamescom conference – but throughout the demo the concept of absolute freedom is repeatedly driven home. While Rico can propel himself across the island with the tried-and-tested grappling hook & parachute combo – now further improved by the addition of the wing suit – vehicles are still available, for instance. Stealing one and returning it to a safehouse will add it to your repertoire of equipment, which in turn means that you can call a supply drop in at any point to deliver it to your current location. The supply drop is quite lenient, allowing Rico to call in whatever the player wants so long as he hasn’t called another drop too recently. Just Cause 3 doesn’t really care how ridiculous it is to drop a storage crate with a car in it from the sky. It just does it anyway. It doesn’t worry about the fact that once you get a car once you can recall it an unlimited number of times. All it cares about is giving you toys to play with – and if that’s a farmer’s tractor, or a tiny little Fiat-style coupe rather than a rocket launcher, so be it – but the rocket launcher is available too. Once you get your hands on weapons, the chaos can begin. There’s impressive destruction on display, and just like previous titles in the series consequences are minimal. It doesn’t ever look like Rico comes close to death, and even when innocents get caught in the crossfire there’s no punishment. It’s instead all about experimenting with the game’s systems and having fun. Missions are open-ended – the game isn’t going to tell you to approach a specific area in a specific vehicle – if it suits you more to drive than to wingsuit in, that’s your choice. Again, there’s that emphasis on freedom. The mission in question looked fun and plenty destructive, it’s just a shame that the hands-on time didn’t quite match up to that. Limited to the more regimented Destruction and Wingsuit-based challenges that players complete to earn upgrades, these missions drop you into a specific area of the open world with a specific task. The destruction challenges offer up areas of the map with little in the way of enemy resistance and simply challenge the player to cause as much damage as possible. If nothing else this is a great way to see the game’s destruction tech in action and see what some of the weapons at Rico’s disposal can do, but without the drama of enemies attacking and an actual mission at hand, some of the fun is lost. In the context of the game these may work, but in this isolated hands-on this challenge type honestly left me cold. As such, I spend most of my demo in the wingsuit. The challenges here are essentially Pilotwings (no bad thing), starting you high up and challenging you with flying through rings for a higher score. The suit feels responsive and fun to use, and it’s easy to see how this is likely to become most players’ go-to method of getting across Just Cause 3’s seemingly sprawling world. The views on offer are impressive, too, and drive home that while perhaps Just Cause 3’s character models aren’t the most technically impressive, the world around them is vast and gorgeous. The fact that I was actually a little frustrated I didn’t get to go beyond the confines of the challenges in my hands-on can actually be seen as something of a positive. I felt that frustration because the tools and mechanics on offer in Just Cause 3 look to up the ante and left me eager to see just what sort of mayhem I could cause myself. But in this demo, at least, I couldn’t. It looks like I’m likely to have quite a bit of fun come December, though. Just Cause 3 is out December 1 on Xbox One, PC and PS4.